Gemini Announces G4V Controller: Twitch meets DDJ? Gemini unveiled their new controller today, and by the looks of it, they’ve got their eye on CDJ enthusiasts. 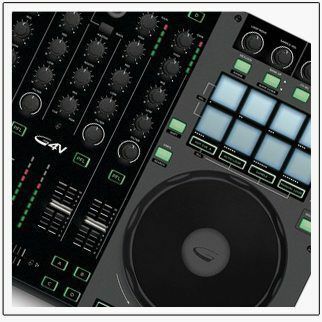 The G4V, a DDJ-style all-in-one controller that features 4 deck mixing options, touch sensitive 14-bit jogwheels, and balanced XLR and RCA booth outputs. Gemini seems to have taken a cue from other controllers like the new Mixtrack Pro and Twitch and included 16 square rubber pads that allow for so-called “Instant Gratification” presses as well as hot-cue mapping and MIDI mappability. The jogwheels seem to be the focal point of the controller, with Gemini claiming they are “extremely touch-sensitive and responsive.” The G4V interestingly enough does not ship with Traktor or Serato, but instead comes with Virtual DJ LE. At a price point of $399, Gemini looks to be aiming in this foray to capture DJs perhaps interested in the DDJ/CDJ side of controllerism, but who don’t have the budget to quite go “all out.” More info about the G4V is available on the dedicated website. Stay tuned for more information on this controller as more information comes out.